E-commerce is certainly among the most rapidly growing sectors globally with retail sales in the trillions of dollars range last year and estimated to surpass US$ 27 trillion in 2020. Asia is gaining a stronger foothold in this fledgling market as the Asia-Pacific is among the world’s largest retail e-commerce landscapes with sales predicted to reach 2.7 trillion dollars by 2020. In addition, the region is expected to facilitate the most rapid growth in e-commerce sales. Last year, sales rose by well over 25 percent. And this fast-paced growth in a region coming into its own as a viable global economic and development hub is propelled by factors such as a rapidly expanding and aspirational middle class, growing mobile and internet penetration, an increasingly competitive e-commerce market, and improved logistics and infrastructure that create the ideal environment for e-commerce to prosper. Sri Lanka is seeing its fair share of fledgling e-commerce entrepreneurs. While the local market continues to trail the region, a slow but steady rise in e-commerce startups by Generation Z entrepreneurs such as Abhishek Sithampalam is laying the foundation for a dynamic sector. The global e-commerce market is not without its challenges, some of which are especially daunting for markets such as Sri Lanka that have lagged behind for too long and are now fighting to stamp their global footprint. While corporate gurus attribute this lag to many reasons that include bureaucratic red tape, economic hurdles and a lack of long-term cohesive policy, Sithampalam is refreshingly upbeat. Sithampalam asserts that a population of nearly 21 million versus neighbouring India’s staggering 1.3 billion – or even further afield with Malaysia’s 31.2 million, Thailand’s 68.9 million and Indonesia’s 261 million-strong populations – is a major disadvantage to a thriving e-commerce market that’s mainly driven by customer numbers. But he is certain that this doesn’t represent a death knell to the sector – even before it takes off in earnest: “Every country, market and situation has its unique challenges and hurdles. There is very rarely a one-size-fits-all solution. 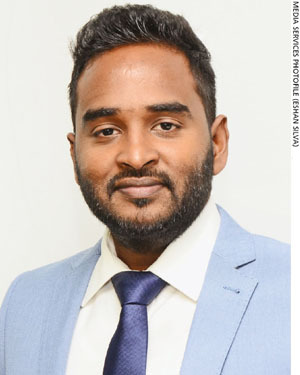 Sri Lanka’s e-commerce sector has its fair share of daunting challenges but with enterprise, hard work and the right attitude, they can be overcome,” he maintains. As the head of a rapidly expanding startup, Sithampalam believes that where the country falls behind in terms of numbers, infrastructure and so on, entrepreneurial attitude can be a game changer. “Our talent is phenomenal especially in the IT industry. If we recognise this and invest in it, and offer opportunities [for people] to grow and improve, we won’t lose out to foreign markets that recognise talent and are willing to pay for it. And we won’t need to spend more on high-priced products and services developed by foreign companies, which offer our youth better opportunities than we do,” Sithampalam points out. Conceding that issues such as pay scales and other benefits are linked to a wider economic scenario, he urges investors to do their part. “With our grasp of local culture, we are in a better position to craft a dynamic and fluid e-commerce sector than global players. If only we were bold enough to take on the challenges and risks!” Sithampalam quips, in conclusion.